Market Rasen Under 16s travelled to Metheringham for the first league game of this season on Sunday. The early stages were tight with both teams struggling to keep the ball and serving up some scrappy football. Rasen gradually got the ball on the floor, and started to create chances, looking the better footballing team as they took control. But disaster struck midway through the first half when Rasen were reduced to 10 men after Joe Robinson was shown a second yellow card. Rasen took hold of the game in midfield after a firm half-time team talk and played the more incisive football despite being a man short. They continued to create chance after chance, but as the second half wore on, the frustration grew as they were unable to beat Metheringham’s keeper and score the goal their football deserved. With ten minutes left Rasen won a free-kick on the edge of the box and man-of-the-match Robbie Goulsbra scored a great goal, sending the set piece just under the bar for a well-deserved lead. Metheringham increased the pressure and the pace, stretching the game with entertaining end-to-end football. The hosts had their best attack in the final minutes, splitting Rasen’s defence in two, but Max Casson made a wonder save. The resolute performance and two points gives Rasen the ideal start to what will be a hard season. A fantastic team display was lit up by some great individual performances especially from the strong midfield trio of Tom Carter, Alex Negrillo and Tom Robinson. 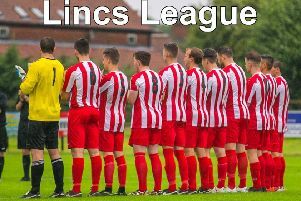 They next face a tough County Cup match against Cleethorpes Town Pattison’s at Rase Park on Sunday (12.30pm ko).